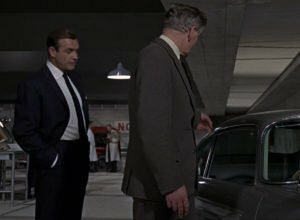 Who is wearing the trendier suit in Goldfinger, James Bond or Q? Except for narrow lapels and covered buttons, Bond’s blue suit is classic in every way. 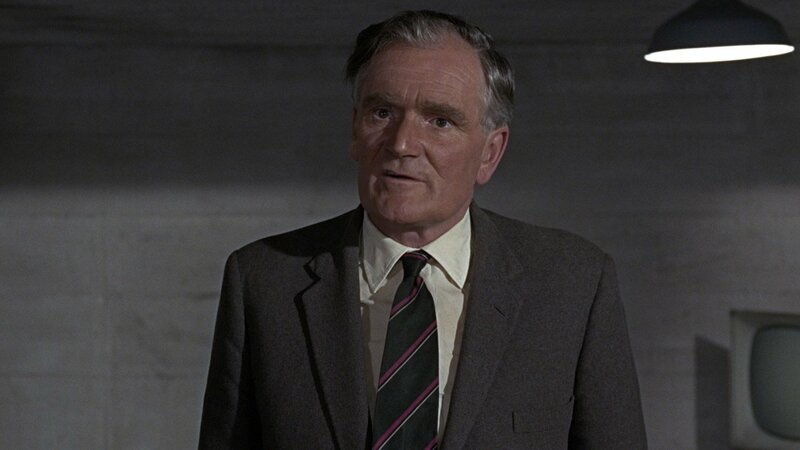 Q’s (Desmond Llewelyn) solid brown tweed suit, however, has many features that date it to the 1960s. 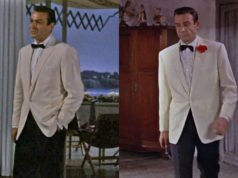 Like Bond’s suit jacket, Q’s suit jacket has narrow lapels, but it also has narrow pocket flaps that are placed rather low. The short double vents are another 1960s detail. But perhaps the most outdated part of the suit is the way the quarters are cut. The front of the jacket cuts away below the waist as it ordinarily would, but the curve of the front edge into the hem has a very small radius that’s almost—but not quite—a sharp corner. The suit’s overall silhouette, however, is a classic button two jacket with natural shoulders and just a little drape in the chest. The jacket also has swelled edges and 2-button cuffs. The trousers likely have single or double forward pleats, which were the common suit trouser styles in England at the time. They are finished with turn-ups. Q’s suits almost always have fit problems, and on this suit the collar stands away from the neck and the sleeves are too long. This is because actor Desmond Llewelyn has round shoulders and needs his jackets to be cut longer in back to be balanced. He’s not an easy man to fit. Q’s cream shirt has a spread collar and double cuffs. His tie is black with narrow burgundy stripes and a narrower white pencil stripes below each burgundy stripe. If it is a regimental tie, can anyone identify it? His shoes are brown, which match the overall town-and-country look of the outfit. Looks like a Royal Navy stripe. The Royal Navy tie is navy, not black, the stripes are much different. Thanks for finding that tie. It’s not exactly the same, but it’s close enough that it’s probably the same tie. On the pictures in the Radley merchandise shop you can see, that the tie is very much the same, as on the movie stills. I agree with this. I think his kind of ill fitting clothes make him much more endearing. It mixes very well with his expression and exasperated sighs. I agree as well, his suits and dress style in all the films remind me of my old school science teacher. Almost a dishevelled look of someone who’s mind is on their work rather then what they look like. The cloth is certainly woolen, and my best guess is herringbone tweed. But mottled flannel is also a possibility. 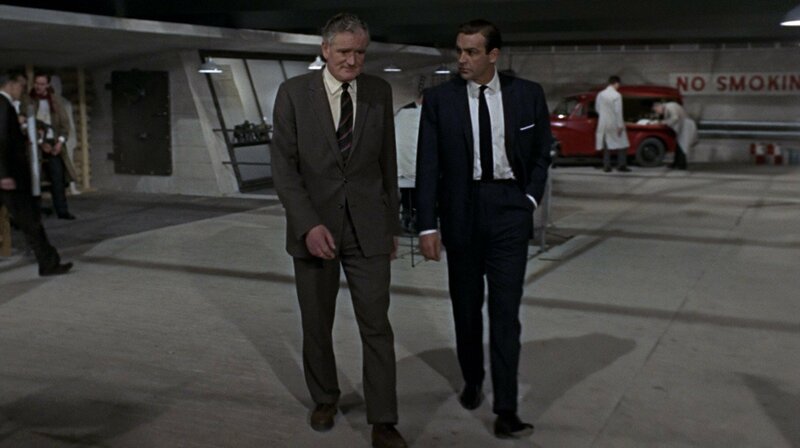 I think the idea in this scene is that Q’s poor tailoring contrasts with Bond’s effortless style. 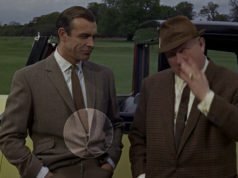 While I realize Desmond Llewelyn’s suits in the series are characterized by slightly over-width shoulders with bad padding, I never understood why this remained the case for all his appearances – except his first. 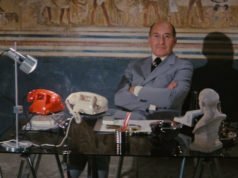 It is a shame that – if nothing else – his morning suit jacket in OHMSS was not tailored with the same care. Unfortunately, that one appears to have been made to similar specifications as the jacket shown here in Goldfinger. Could Q be wearing an Intelligence Corp tie? It looks possible to me. However I really like the idea of Desmond wearing his own clothes. That tie has different colours. Charles Day found the right one: Radley College.